With my upgraded General ticket I wanted an HF radio that: has computer control capability, that might be used for Automatic Link Establishment (ALE), that could be used for a beacon system, Small to fit into the Light Weight Beacon back pack. The Ten Tec Pegasus and ICOM 706 were on the short list below for PC-ALE. The Pegasus currently has no front panel, but a FP model will be out in a few months. For computer use the front panel is of little value, but for programming (my interest) it sure makes life easier. The SGC - SG-2020 would be an excellent radio for this project, but it does not have computer control capability at this time. There is an SG-2020 Club. The Harris RF-3200 is another ALE capable mil radio as are the Harris 5020 series radios (like the PRC-138), or the Motorola Micom. Icom has a land mobil (not ham) HF radio with built-in ALE. There are two versions I know of, the IC-F8100 and the IC-F8101. 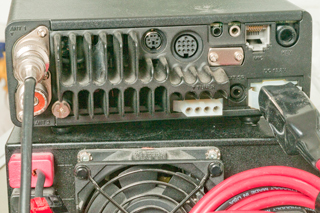 There is a difference in how external connections are made, the F8100 used an optional adapter box to end up with a few DB type connectors but the IC-F8101 has those same connectors all on cables coming out the back and so does not require an additional adapter box. A bigger difference is that the IC-F8100 needs that external box to hold the RapidM card, but the IC-F8101 holds the card inside the main chassis, so a much more compact solution. 1.6 to 29.9... Tx and receive 0.5 to 29.9.... MHz. Built-in ALE, but as of Nov 2014 it may or may not work. There's an optional RapidM third party data modem module that can be installed internally that also supports many flavors of ALE. I will use my existing B&W 1.8 - 30 T2FD BWD-1.8-30. This is a folded dipole with a termination on the far side from the balun. It makes a great wide band receiving antenna. On transmit it is not as efficient as other types of antennas. I have not yet looked into an antenna for 2m & 400 - that's on a separate connector. April 11, 2013 - Using TCI 651T antenna. I a planning to use the Light Weight Beacon Part No. 123402 Antenna. Instead of fixing the broken screw driven tuning slugs, I will replace the bottom section with a couple of feet of PVC pipe. But first I need to trench and install 12 each 80' long ground radials and a connecting ring (about 1,500 feet of Cu wire). Also a trench with conduit for the coax and control wiring to the antenna would be nice. Then put up this 55 foot tall antenna that all fits into a back pack. The SGC - SG-231 Smartuner® looks ideal for this antenna. The manual (online at SGC) has instructions for interfacing the 231 to the 706 so that the "Tune" function works. The 231 differs from the 230 in that the upper frequency limit is 60 MHz, thus it will work for HF plus 6 meters. There is information on how to connect the 231 to the IC706 so that the "tune" function works properly. The "smart tune PRO" accessory can also be used with the 231 to allow control of when the tuner attempts to tune. Note that the normal smart tune accessory will not work with the 231, maybe because of a difference in the connectors, the 231 does NOT have the receive amplifier that's in the 230PRO. There is also an option to allow receive operation in a straight through mode (no tuner like would be the case for ALE) or with the tuner working to improve reception at frequencies close to the transmit frequency. Note that the 231 is an antenna Coupler not an antenna Tuner. The difference is that a tuner (the military might call it a line flatter) is a device with coax inputs and outputs (maybe sometimes ladder line in/out). It's job is to transform the impedance on a transmission line to 50 Ohms to match a transmitter output. 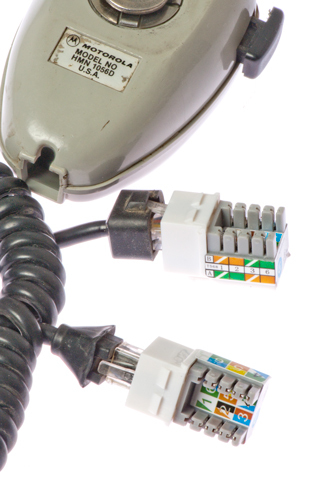 A coupler has a coax input form the transmitter but has a single terminal that has high voltage insulation because it drives a wire (NOT COAX) that is part of the antenna. A coupler is preferred because the VSWR on the coax to the transmitter is low. In the case of an antenna tuner the coax between the antenna and tuner has a high VSWR and hence high losses. SGC has a lot of practical information on their web site about how to correctly use their antenna couplers. There is a new model SG237 that is a 1.6 - 60 MHz design that is smaller and lighter than the 231. It has one less inductor and one less cap on the output for 1/2 million combinations vs. the 4 million for the 231. The 231 is also rated for more power. It's not clear about the connectivity to the IC706 "tune" function. The 231 is directly supported. The lower frequency rating on the 231 is 1.0 MHz vs. 1.6 for the 237. The 237 comes in the normal type box and also as a raw PCB and the third variation is mounted in a box that matches the SG2020 transcivier. The 237 only draws about 300 ma and the 231 about 500 ma? The next step may be to try to put together some kind of time delay beam steered array of antennas. 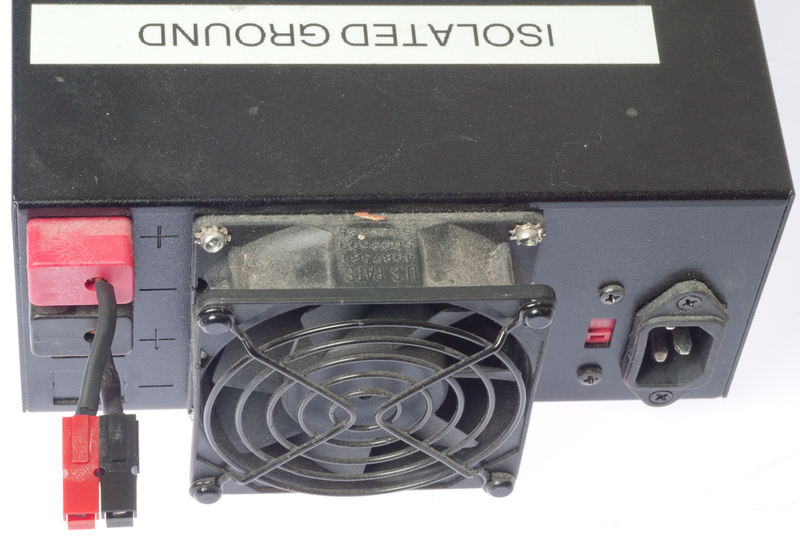 In order to power either the IC 706 (13.6 VDC @ 20 A) or a PRC-47 (28 VDC @ 20A) I came up with the idea of using a 12 volt deep cycle storage battery and a line powered 12 VDC supply. 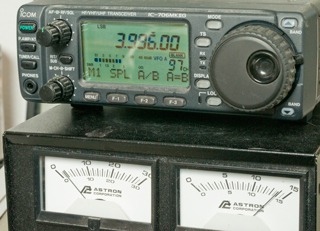 The Astron SS-30M switching mode supply weighs only 5 pounds and includes a volt & amp meter. The SS-30M is about the same size and weight as the 706 so I have the 706 sitting on top of the SS-30M. In receive mode the 706 draws less than 2 Amps. The quiet fan on the SS-30M turns on and off every now and then. 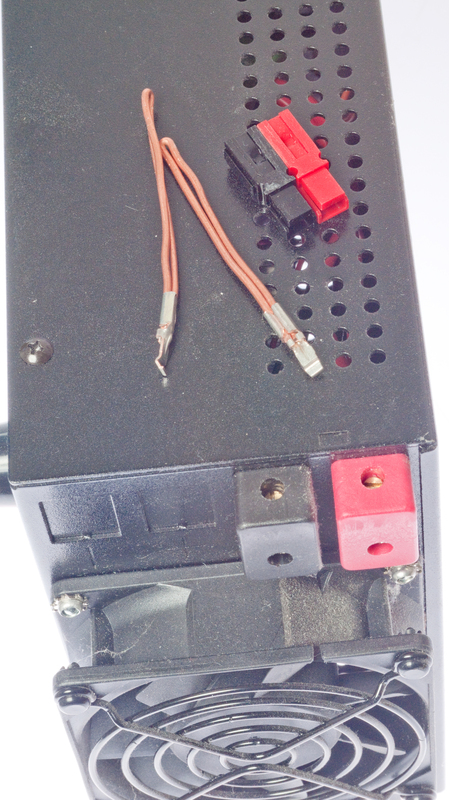 My old linear 13 Amp 28 Volt supply weighs about 40 pounds and is not strong enough to power the PRC-47. It turns out that with the metering on the SS-30M that the PRC-47 could be powered by my older supply in the low power mode. There is a problem with the PRC-47, not the power supply. The battery was on sale at Wal-Mart and is marked as a trolling battery, 115 AH. I am now working on the system of connectors to accommodate powering either of the two radios in many optional ways, as well as many 12 VDC items like GPS receivers. Note that the SS-30M has an internal strap between the black negative output terminal and the case & line grounds. This was added because some users had problems with RF interactions. I have lifted the PC board end and shrink tube insulated it so that the supply can be used in a floating mode because I plan to ground the negative terminal of the 12 volt battery. I am using 6-20 connectors that the local hardware store has in stock. These are rated 250 V @ 20A. They have a ground terminal like on U.S. household grounded connectors but one of the blades is turned 90 deg. from normal and the other is a "T" shape. This will prevent anyone from plugging a normal AC type plug into the DC sockets. I am using the "-" terminal for 12 VDC and the "T" for 24 VDC, with the ground terminal for ground. 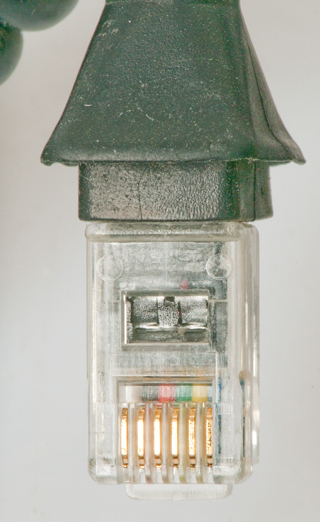 Note that there is a 5-20 connector that looks very similar but has a different arrangement of terminals. 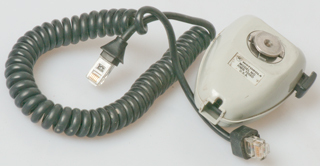 For power sources like the battery and charger the socket is used. For loads like radios and inverters the 6-20 plug is used. This is the same convention used with most power connections so that it is less likely to have a short. The battery will be charged and maintained by the Statpower - TC-10hw (Statpower calles it the TC-10tb, terminal block) smart charger. This is a mocroporcessor controlled charger made for marine use. The hw model is for hard wiring and can support two independent battery banks. It's a 10 amp unit but will charge faster than some higher amp units because of the smart nature of the charge. Circuit Drawing DC.dwf (Free Volo or WHIP! Viewer from Autodesk). 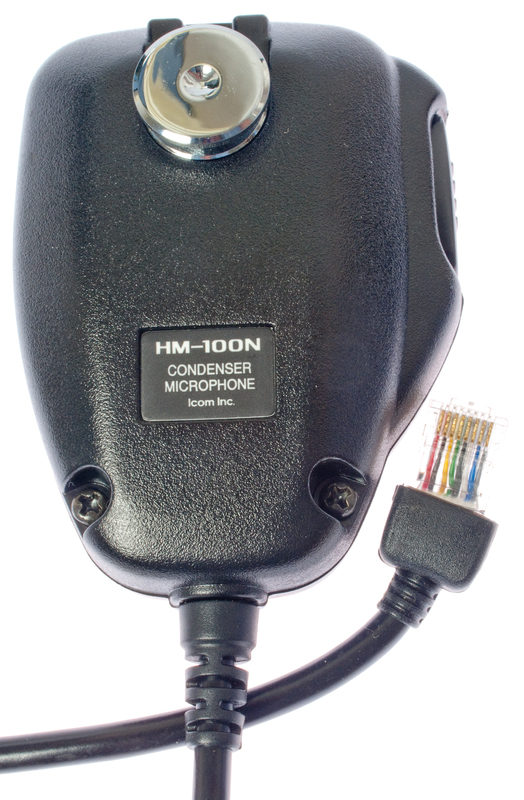 The stock HM-103 mike uses an RJ-45 connector and is a powered condenser mike. Connecting a military M80 or H250 dynamic microphone does not work because there's not enough audio output. An expedient microphone might be to use a Motorola unit and install a new RJ-45 connector with the correct wiring. 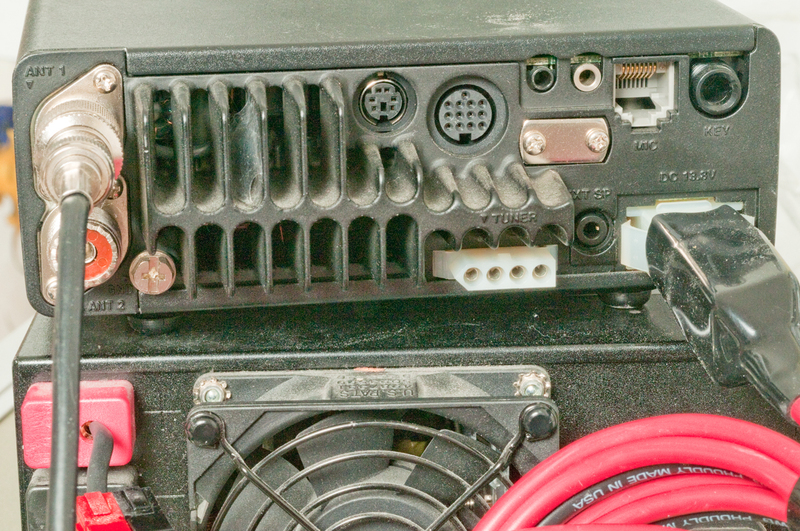 The mike cord has an RJ-45 on the radio end and an 6P6C on the mike end. There is not a connection to the metal disk on the back of the mike, but. . . pin 5 connects to the metal plate below the disk and the 4 sheet metal springs. This would allow sensing if the mike was connected to a m3tal mike clip that was grounded (Hang-Up Mechanisms). When plugged into the 706, keying PTT does nothing. With the DMM in diode test mode there is no sound from the mike with the test leads on any two terminals (PTT or/PTT), so no dynamic mike element. 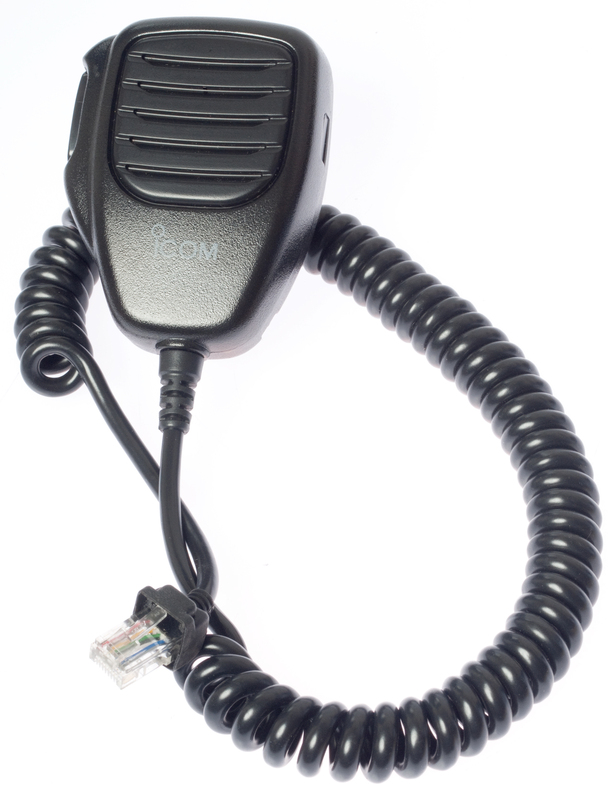 The Micom 2 mike is similar, but not usable directly on the 706. The Micom 2 mide does not match the 1056D in the PTT area. Using Keystone Jacks to make it easier to test cable. 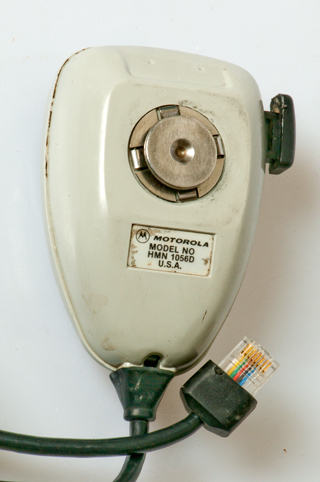 The Motorola mike did not work out because the wiring is complex. After upgrading to the Heil HC5.1 dynamic element I'd like to use this mike, but will need a blocking capacitor to (1) keep from overloading the DC mike drive circuit in the 706 and keep DC from effecting the magnetic properties of the dynamic element. The computer control commands for the IC706MkIIG are on pages 45 & 46 of the owners manual. 8500A, 755DSP, 820H, 821H, R10, 706, 706MkIIG, 746, 756. Page created 7 June 2000.